For other uses, see Ürümqi County. 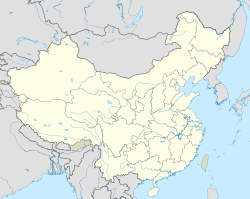 Ürümqi (UK: /ʊˈrʊmtʃi/, US: /ˌʊrʊmˈtʃiː/; Uyghur pronunciation: [ʏrʏmˈtʃi]; Uyghur: ئۈرۈمچى‎ CTA:Ürümçi; Chinese: 乌鲁木齐; pinyin: Wūlǔmùqí), abbreviated Wushi (Chinese: 乌市; pinyin: Wūshì), formerly known as Tihwa (Chinese: 迪化; pinyin: Díhuà), is the capital of the Xinjiang Uygur Autonomous Region in the far northwest of the People's Republic of China. Ürümqi was a major hub on the Silk Road during China's Tang dynasty, and developed its reputation as a leading cultural and commercial center during the Qing dynasty in the 19th century. "to enlighten (the uncivilized people)"
With an estimated population of 3.5 million in 2015, Ürümqi is the second-largest city in China's northwestern interior as well as the largest in Central Asia in terms of population. According to the Guinness Book of Records, Ürümqi has earned a place as the most remote city from any sea in the world. Ürümqi has seen a huge economical development since the 1990s and currently serves as a regional transport node, a cultural, political and commercial center. Although Ürümqi is situated near the northern route of the Silk Road, the present city is a relatively young city – the earliest known settlement in the area can be dated to the 7th century CE, while the current city was not known as Ürümqi until the time of the Dzungar Khanate in the 17th century. During prehistory, the Jushi or Gushi, a nomadic people who lived on the northern slopes of the Tianshan Mountains, inhabited the area. The oldest known settlement in the area, a village called Urabo (or Wulabo), was located about 10 kilometres (6 miles) from the southern suburbs of present-day Ürümqi. Under the name Luntai, the present city was established near Urabo by the Tang government during the 22nd year of Emperor Taizong's reign (648 AD), as part of the Protectorate General to Pacify the West that controlled Xinjiang. It was a seat of local government, and collected taxes from the caravans along the northern route of the Silk Road. After the Tang retreated from the Western Regions, the region came under the control of the Uyghurs of the Khaganate and Gaochang/Qocho. After the Tang until the Qing Dynasty, there was little information about the Ürümqi area, and there appeared to be no permanent settlement here for most of this period. The Mongols referred to the wider area as Bishbalik meaning five cities, referring to the five towns that surrounded the present-day Ürümqi area. The Oirats Dzungar tribes that formed the Dzungar Khanate were the last major power to control Ürümqi before the Manchus gained control of Xinjiang, and their language gave Ürümqi its modern-day name. In the Ming dynasty, there was a record of a place at Jiujiawan 5 kilometres (3 miles) to the west of present Ürümqi, which may have been the Dzungar town that was later destroyed during the Qing conquest. The Mongolians also used the area as herding ground in this period. 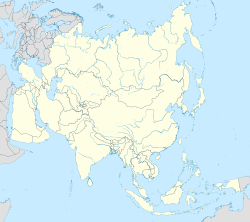 Steppe peoples had used the location, the pass between the Bogda Shan to the east and the Tian Shan to the west, connecting the Dzungar Basin to the north and the Turpan Depression to the south. Ürümqi remained a small town, and less important than the oasis and Silk Road trade center Turpan 200 km (120 mi) to the southeast. Fighting for the control of Dzungaria led to the Khoshuuts (now classified as Mongols) leaving Ürümqi for Qinghai and Tibet in the 1620s and 1630s. The Uyghurs were introduced into the Ürümqi area in the 18th century by the Dzungars who moved them from the west Tarim region to be taranchis or farmers in Ürümqi. In the 18th century, the Qing went to war against the Dzungar Khanate. Ürümqi was taken by the Qing in 1755, and the Dzungars of the region were eliminated in the Dzungar genocide. One writer, Wei Yuan, described the resulting desolation in what became northern Xinjiang as "an empty plain for a thousand li, with no trace of man". A fort was built (either in 1755 or 1758 depending on sources), and the Qing then established garrisons of Manchu and Mongol bannermen and Han Chinese troops at Ürümqi. After 1759, the Qing government established state farms in the under-populated areas around Ürümqi, where there was fertile, well-watered land. The Manchu soldiers also constructed a temple with red walls dedicated to Guandi on Pingding mountain overlooking Ürümqi, which gave Ürümqi its nickname, Red Temple. The Manchus began to construct a walled city in 1763 to the south of the first fort, and it was completed in 1767. The Qianlong Emperor had named the new settlement "Dihua" (Chinese: 迪化; pinyin: Díhuà; Manchu: Wen de dahabure fu), meaning "to enlighten (the uncivilized people)". In 1771, another city named Gongning Cheng (鞏寧城) was built nearby to the northwest to house Manchu bannermen, and this would become the seat of government. The bannermen settlement to the west was commonly referred to as Mancheng (滿城; 'Manchu City'), while Dihua to the east became a Han Chinese town commonly called Hancheng (Han City). The Ürümqi of the early period was therefore a twin-city, with Gongning Cheng the administrative center while Dihua grew into Xinjiang's commercial and financial center. Han Chinese from all over China moved into Dihua, as did Chinese Hui Muslims from Gansu and Shaanxi. The origin of Hui in Ürümqi is often indicated by the names of their Mosques. By 1762, more than 500 shops had already been opened by Chinese migrants to the area of modern-day Ürümqi. Those Qing literati who visited Dihua were impressed by its cultural sophistication and similarity to eastern China. The writer Ji Xiaolan compared Dihua to Beijing, in that both had numerous wine shops which offered daily performances of Chinese music and dance. In 1870, the Battle of Ürümqi took place between the Turkic Muslim forces of Yaqub Beg against the Dungan Muslim forces of Tuo Ming (Daud Khalifa). With the help of Xu Xuegong's Han Chinese militia, Yaqub Beg's forces defeated the Dungans. Gongning Cheng was captured, its Qing administrator killed, and the city burnt to the ground and abandoned. The Qing later regained control of Ürümqi. In 1884, the Guangxu Emperor established Xinjiang as a province, with Dihua as its capital. After the collapse of the Qing dynasty, Xinjiang was ruled from Ürümqi by a succession of warlords: Yang Zengxin (1911–1928), Jin Shuren (1928–1933), Sheng Shicai (1933–1942), and Zhang Zhizhong as governor of Xinjiang in 1942–1949. Of these, Yang and Sheng were considered capable rulers. During the Kumul Rebellion, the Battle of Ürümqi (1933) and the Battle of Ürümqi (1933–34) took place between the forces of Ma Zhongying's 36th Division (National Revolutionary Army) and Jin Shuren and Sheng Shicai's provincial forces. At the second battle, Ma was assisted by the Han Chinese General Zhang Peiyuan. Following the founding of the People's Republic of China, on 1 February 1954, the city's name was officially changed back to its Dzungar Oirat name Ürümqi, meaning "beautiful pasture" in the Oirat language of the Dzungar people. In the late 1970s, Deng Xiaoping relaxed China's tight control over Xinjiang, and Ürümqi benefited from the development of the oil and gas industry in Xinjiang. New mosques were built in Ürümqi with financial assistance from the Chinese government. While the Chinese government implemented strict rules on religion in southern Xinjiang, the treatment of the Uyghurs and their religion in Ürümqi were more lax and permissive. In May 1989, unrest in Ürümqi resulted in 150 injuries. In February 1997, bombings in Ürümqi following the Ghulja incident resulted in 20 deaths and scores of injuries. In the largest eruption of ethnic violence in China in decades, there were riots in July 2009 between ethnic Han Chinese and Uyghurs. The New York Times reporter covering the riot described the violence as "clashes with riot police and Uyghurs rampaging through the city and killing Han civilians. Then, for at least three days, bands of Han vigilantes roamed Urumqi, attacking and killing Uyghurs." Before the riot broke out, young Uyghurs had marched through the city "to protest a case of judicial discrimination". According to official figures, most of the 197 killed in the riot were Han, a statement disputed by Uyghurs. The location 43°40′52″N 87°19′52″E﻿ / ﻿43.68111°N 87.33111°E﻿ / 43.68111; 87.33111 in the southwestern suburbs of Ürümqi (Ürümqi County) was designated by local geography experts as the "center point of Asia" in 1992, and a monument to this effect was erected there in the 1990s. The site is a local tourist attraction. Although surrounded by deserts (the Gurbantünggüt in the north and the Taklamakan in the south), the Ürümqi area is naturally watered by a number of small rivers flowing from the snow-capped Tian Shan mountains: the main range of the Tian Shan in south of the city (Ürümqi County), and the Bogda Shan east of the city (Dabancheng District). A network consisting of thousands of miles of canals, reservoirs, and underground tunnels called karez, redistribute the water throughout the extensively irrigated area along the foothills of the mountain range. It compromises an ancient irrigation system built 2,000 years ago. As the Ürümqi region's population and economy are growing, the water demand exceeds the natural supply. To alleviate water shortages, the Irtysh–Ürümqi Canal was constructed in the first decade of the 21st century. The canal's main trunk terminates in the so-called "Reservoir 500" ("500"水库; 44°12′00″N 87°49′00″E﻿ / ﻿44.20000°N 87.81667°E﻿ / 44.20000; 87.81667) in the far north-eastern suburbs of the city (on the border of Ürümqi's suburban Midong District and Fukang City). A new industrial area, called Ganquanbao Industrial Park (甘泉堡工业园), or Industrial New City 500 (500工业新城) was being developed in 2009, west of the reservoir, relying on it for water supply. From the reservoir area water is further distributed over a network of canals throughout the lower Midong District. In Ürümqi, a continental cold semi-arid climate (Köppen climate classification BSk) prevails, with very large differences between summer and winter. It has warm summers, with a July daily average of 23.7 °C (74.7 °F), and very cold winters, with a January daily average of −12.6 °C (9.3 °F). The annual average temperature is 6.90 °C (44.4 °F). The city is semi-arid, with its summers slightly wetter than its winters, yet sunny weather is much more likely in the warmer months, and relative humidity is the lowest during summer. With monthly percent possible sunshine ranging from 30 percent in December to 70 percent in August and September, the city receives 2,523 hours of bright sunshine annually. Its annual precipitation is about 290 millimetres (11.4 in). Extremes since 1951 have ranged from −41.5 °C (−43 °F) on 27 February 1951 to 42.1 °C (108 °F) on 1 August 1973. According to the National Environmental Analysis released by Tsinghua University and the Asian Development Bank in January 2013, Ürümqi is among the top ten cities in the world with the most air pollution. According to this report, seven of these cities are in China, including Taiyuan, Beijing, Lanzhou, Chongqing, Jinan, and Shijiazhuang (besides Ürümqi). Blacksmith Institute mentioned Ürümqi in 2007 World’s Worst Polluted Places caused by air pollution along with Linfen and Lanzhou, all in China. In 2008, Toronto Star listed Ürümqi as one of the Top Ten worst places to live in the world due to sulphurous pollution. Heavy haze is extremely common in winter, which frequently affects air traffic. Officials believed that severe winter air pollution in Ürümqi is mainly caused by energy-heavy industries and the outdated coal-firing winter heating system. According to a report by Department of Environmental Science and Engineering of Fudan University, the average PM2.5 and TSP concentrations in the winter of 2007 were 12 times higher than USA standard for PM2.5 and 3 times the National Ambient Air Quality Standard of China for TSP. The sulfur dioxide from industrial emissions mixed with the local anthropogenic aerosol with the transported soil dust from outside the city were the main sources of the high concentration of sulfate, one of the main factors causing the heavy air pollution over Ürümqi. Because of the use of a single time zone for all of China, in Ürümqi which is at a far western location in China, the sun is 2 hours and 10 minutes behind China Standard Time (CST = UTC+8). During early January the sun does not rise until 09:45 and it sets between 18:45 and 19:10 local time. In September and March the sun rises around 08:00, and sets around 19:45. However, in June the sun rises at about 06:25 and does not set until 21:45. Ürümqi currently comprises 8 county-level subdivisions: 7 districts and 1 county. Ürümqi has been a multi-ethnic city from the time of the Qing conquest; in the early years, the Manchus lived in Gongning Cheng, Han Chinese in Dihua, and various other ethnic groups such as the Hui, Uyghurs and others in the suburban districts. The Muslims settled to the south of the walled-city of Dihua, and although the walls have since been demolished, the Muslims are still concentrated there. A census of in 1787 showed that there were 114,348 Hui and Han in the prefectures of Zhenxi (which included Barköl and Hami) and Ürümqi. In Ürümqi city itself, there were 39,000 people in the 1880s, and by the early 20th century, 50,000 people. Ürümqi in 1908 was said to have been inhabited by Uyghurs (then called Turkis), Chinese, Manchus and a few Mongols, with the Uyghurs estimated to comprise a quarter of the population. In the People's Republic era, an active program to resettle Han population in Xinjiang was initiated. In 1960, there were 76,496 Uyghurs and 477,321 Han Chinese in Ürümqi. According to the 2000 census, Ürümqi had 2,081,834 inhabitants, with a population density of 174.53 inhabitants/km2 (452.3 inhabitants/sq. mi.). In the 2010 census, the population was recorded as 3,112,559. Part of the increase is due to boundary changes, for example, Miquan was merged into Midong District and became part of Ürümqi in 2007. Ürümqi is a major industrial center within Xinjiang. Ürümqi, together with Karamay and Korla, account for 64.5 percent of the total industrial output of Xinjiang. Ürümqi is also the largest consumer center in the region, recording ¥41.9 billion retail sales of consumer goods in 2008, an increase of 26 percent from 2007. The GDP per capita reached US$6,222 in 2008. According to statistics, Ürümqi ranked 7th in 2008 by the disposable income for urban residents among cities in Western China. Ürümqi has been a central developmental target for the China Western Development project that the Central Government is pursuing. The Ürümqi Foreign Economic Relations and Trade Fair (Chinese: 乌洽会) has been held annually since 1991 and has been upgraded into the first China-Eurasia Expo in 2011. Its purpose is to promote domestic and foreign markets. The 17th Fair has attracted participants from the Ministry of Commerce and the China Council for Promotion of International Trade. Xinjiang Guanghui Group (新疆广汇集团) is the largest real estate enterprise and most powerful privately owned company in Xinjiang and is currently engaged in energy and automobiles. China CITIC Bank Mansion (中信银行大厦), headquarters of Guanghui, located in one of the CBDs in North Xinhua Road, is the tallest building in Ürümqi and Xinjiang; with a height of 229 metres (751 feet), it is also the tallest in Northwestern China and Central Asia. Zhongshan Road (Sun Yat-sen Road, Chinese: 中山路) has been one of the ten most famous commercial streets in China since 2005. Zhongshan Road has always been the hub of consumer electronics in the city, with the largest computer, mobile phone and consumer electronics market in Xinjiang, including Baihuacun, Cyber Digital Plaza and Fountain Plaza. As the economic center in Xinjiang, Ürümqi has expanded its urban area since the 1990s. The CBDs in the city increased rapidly all around the major districts. Despite the old city areas being primarily in the south, the development in the north part began since the late 1980s. The completion of the new office tower for Ürümqi Municipal Government in 2003 at Nanhu Square (南湖广场) in Nanhu Road marked a shift of the city center to the north. Lacking a subway, the city commenced the construction of viaducts for Outer Ring Road (外环路) since 2003, which considerably facilitates transport. Youhao Road (友好路) and surrounding neighborhood, is the commercial center for business, shopping and amusement. Youhao Group (友好集团), the namesake local enterprise, owns a major market share of retails. Maison Mode Urumqi (乌鲁木齐美美百货), open since 2008, became one of the few notable department stores for luxury merchandise in the city. The Ürümqi Economic and Technological Development Zone (UETD) located in the northern Toutunhe District, has been a leading base for steel, machinery manufacturing, biochemistry and other industrial innovations. Grand Bazaar, a bazaar on South Jiefang Road (解放南路). Hong Shan (Red Mountain) is the symbol of Ürümqi, located in Hongshan Park. People's Park, south of Hongshan Park. Xinjiang Uygur Autonomous Region Museum (新疆维吾尔自治区博物馆), which was completely rebuilt in the early 2000s. Heavenly Lake Scenic Area, a popular park with some of China's most famous alpine scenery, over two hours outside Ürümqi. Shuimogou Hot Springs (水磨沟温泉) is located 5 km (3.1 mi) northeast of Ürümqi. Xinjiang Silk Road Museum (新疆丝绸之路博物馆) is located next to the Grand Bazaar at No. 160 Shengli Road. It is located on the fourth and fifth floors of a large European-style building which houses a shopping complex as well. Most of the exhibits have English names as well and some of the guides speak some English. Ürümqi City Museum (乌鲁木齐博物馆) is located at South Nanhu Road 123 (南湖南路123号). Ürümqi Tatar Mosque (乌鲁木齐塔塔尔寺清真寺) is a luxuriously furnished mosque located on Jiefang Road. The mosque is open to female and male visitors unlike other mosques. However, permission must have been obtained prior to visiting the mosque. Xinjiang International Grand Bazaar in Ürümqi City Tianshan District, which is currently the country's largest bazaar. The architectural style of the Grand Bazaar has an Islamic style. Inside, dazzling, exquisite commodities of ethnic minorities are sold. Ürümqi Silk Road Ski Resort (丝绸之路滑雪场) is located in Ürümqi County. Xinjiang University of Finance and Economics. Ürümqi has many educational campuses including Xinjiang University, Xinjiang Normal University, Xinjiang Agricultural University, Xinjiang Medical University and many others. Ürümqi is served by the Ürümqi Diwopu International Airport. It is a hub for China Southern Airlines. 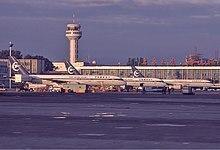 Ürümqi Diwopu International Airport is the largest airport in Xinjiang, and the only airport in China to serve flights from Afghanistan, Kyrgyzstan and Tajikistan. Ürümqi is Xinjiang's main rail hub with two primary railway stations, the older Ürümqi South Railway Station (formerly the Urumqi Railway Station) and Ürümqi Railway Station opened in July 2016. The Lanzhou-Xinjiang High Speed Railway stops at both stations, running from Ürümqi to Lanzhou which has been in operation since the end of 2014. The city is served by several conventional rail lines. Ürümqi is the western terminus of the Lanzhou–Xinjiang (Lanxin) and Ürümqi–Dzungaria (Wuzhun) Railway, and the eastern terminus of the Northern Xinjiang (Beijiang) and the Second Ürümqi–Jinghe railway. The Beijiang and the Lanxin Lines form part of the Trans-Eurasian Continental Railway, which runs from Rotterdam through the Alataw Pass on the Kazakhstan border to Ürümqi and on to Lanzhou and Lianyungang. Many roads to the north and west typically shut down by early October, remaining closed until the end of winter. The Ürümqi Metro opened in 25 October 2018, when the northern section of line 1 was given to the public with 16.56 kilometres (10.29 mi) and 12 stations. The planned system consists of 7 lines totaling 211.9 kilometres (131.7 miles) in length with an estimated cost of 31.24 billion yuan. Line 1 runs between Ürümqi Diwopu International Airport and Balou metro station in downtown Ürümqi. When construction completes, it will end at the Southern Long Distance Bus Station (南郊客运站) with a total length of 26.5 kilometres (16.5 miles) and 21 stations (16 underground, 5 elevated). The Ürümqi BRT bus service was launched in August 2011 after an investment of 930 million yuan in an effort to improve urban traffic. There are currently four routes operated, BRT1, BRT2, BRT3, and BRT5 mainly along the north-to-south downtown major roads. The Xinjiang Networking Transmission Limited operates the Ürümqi People's Broadcasting Station and the Xinjiang People Broadcasting Station, broadcasting in the Mandarin, Uyghur, Kazakh, Mongolian, Russian and the Kyrgyz languages. The Xinjiang Television Station (XJTV), located in Ürümqi, is the major TV broadcasting station in the Xinjiang Uyghur Autonomous Region. The local television station for Ürümqi city is Ürümqi Television Station (UTV)(乌鲁木齐电视台). Xinjiang Flying Tigers is a basketball team that is part of the Chinese Basketball Association, based in Ürümqi, Xinjiang. Its corporate sponsor is Xinjiang Guanghui Group. Xinjiang Tianshan Leopard F.C. is a local football team in the China League One. China started a bandy development programme by organising educational days in Ürümqi in June 2009. In 2015 an indoor speed skating arena was opened. ^ a b "Bulletin for the economical and social development in 2015". Retrieved 16 March 2016. ^ "Urumqi". Oxford Living Dictionaries - English. Retrieved 29 December 2017. ^ "Urumqi". Oxford Living Dictionaries - US English. Retrieved 29 December 2017. ^ Glenday, Craig (29 April 2008). Guinness World Records 2008. Bantam Books. ISBN 9780553589955. ^ "Land farthest from sea". Guinness World Records. Retrieved 7 September 2017. ^ a b "Urumqi". Chinatoday.com.cn. 1 February 1954. Archived from the original on 21 October 2002. Retrieved 19 February 2010. ^ a b c d e Piper Rae Gaubatz (31 March 1996). Beyond the Great Wall: Urban Form and Transformation on the Chinese Frontiers. Stanford University Press. pp. 70–72. ISBN 978-0804723992. ^ James A. Millward (2007). Eurasian Crossroads: A History of Xinjiang. Columbia University Press. p. 89. ISBN 978-0-231-13924-3. ^ James A. Millward (2007). Eurasian Crossroads: A History of Xinjiang. Columbia University Press. pp. 92–93. ISBN 978-0-231-13924-3. ^ James A. Millward (2007). Eurasian Crossroads: A History of Xinjiang. Columbia University Press. p. 99. ISBN 978-0-231-13924-3. ^ Holdstock, Nick (30 May 2015). China's Forgotten People: Xinjiang, Terror and the Chinese State. I.B.Tauris. ISBN 978-1784531409. ^ Zhao, Gang (January 2006). "Reinventing China Imperial Qing Ideology and the Rise of Modern Chinese National Identity in the Early Twentieth Century". Modern China. 32 (Number 1): 3–30. doi:10.1177/0097700405282349. JSTOR 20062627. Archived (PDF) from the original on 25 March 2014. Retrieved 17 April 2014. ^ Jeong Su-il (18 July 2016). "Urumqi". The Silk Road Encyclopedia. ISBN 9781624120763. ^ Millward, James A. (1998). Beyond the Pass: Economy, Ethnicity, and Empire in Qing Xinjiang, 1758–1864. Stanford University Press. pp. 131–134. ^ James Millward (1 June 1998). Beyond the Pass: Economy, Ethnicity, and Empire in Qing Central Asia, 1759–1864. Stanford University Press. pp. 133–. ISBN 978-0-8047-9792-4. ^ Millward, James A. (1998). Beyond the Pass: Economy, Ethnicity, and Empire in Qing Central Asia, 1759–1864 (illustrated ed.). Stanford University Press. p. 169. ISBN 978-0804729338. Retrieved 24 April 2014. ^ Jia, Jianfei (2011). "Whose Xinjiang? The Transition in Chinese Intellectuals' Imagination of the "New Dominion" During the Qing Dynasty". Harvard-Yenching Institute Working Paper Series. ^ James A. Millward (2007). Eurasian Crossroads: a history of Xinjiang. New York, NY: Columbia University Press. pp. 119–120. ISBN 978-0-231-13924-3. Retrieved 28 June 2010. ^ Ho-dong Kim (2004). Holy War in China: the Muslim rebellion and state in Chinese Central Asia, 1864–1877. Stanford, Calif.: Stanford University Press. p. 96. ISBN 978-0-8047-4884-1. Retrieved 28 June 2010. ^ John King Fairbank; Kwang-ching Liu; Denis Crispin Twitchett (1980). Late Ch'ing, 1800–1911. Cambridge, UK: Cambridge University Press. pp. 223–224. ISBN 978-0-521-22029-3. Retrieved 28 June 2010. ^ Cyril E. Black; Louis Dupree; Elizabeth Endicott-West; Eden Naby (1991). The Modernization of Inner Asia. M. E. Sharpe. p. 45. ISBN 978-0-87332-779-4. Retrieved 28 November 2010. ^ Piper Rae Gaubatz (31 March 1996). Beyond the Great Wall: Urban Form and Transformation on the Chinese Frontiers. Stanford University Press. p. 72. ISBN 978-0804723992. ^ "Online Encyclopædia Britannica". Britannica.com. 31 January 2007. Retrieved 19 February 2010. ^ Wiener, Calla (4 March 2015). S. Frederick Starr (ed.). Xinjiang: China's Muslim Borderland. Routledge. pp. 166–167. ISBN 9781317451372. ^ "The Historical and Geographical Role of Urumchi, Capital of Chinese Central Asia." Herold J. Wiens. Annals of the Association of American Geographers, Vol. 53, No. 4 (Dec. 1963), p. 447. ^ Starr, S. Frederick (4 March 2015). Xinjiang: China's Muslim Borderland. Routledge. p. 4. ISBN 9781317451372. ^ Joanne N. Smith Finley (9 September 2013). The Art of Symbolic Resistance: Uyghur Identities and Uyghur-Han Relations in Contemporary Xinjiang. BRILL. pp. 238–. ISBN 978-90-04-25678-1. ^ Joanne N. Smith Finley (9 September 2013). The Art of Symbolic Resistance: Uyghur Identities and Uyghur-Han Relations in Contemporary Xinjiang. BRILL. pp. 240–. ISBN 978-90-04-25678-1. ^ Gladney, Dru C. (4 March 2015). S. Frederick Starr (ed.). Xinjiang: China's Muslim Borderland. Routledge. pp. 379–380. ISBN 9781317451372. ^ a b c "Rumbles on the Rim of China's Empire". New York Times. 11 July 2009. ^ "China's Great Game: New frontier, old foes". Financial Times. 14 October 2015. ^ "DCP: Geographic Center of Asia (visit #1)". ^ a b "'Impossible To Save': Scientists Are Watching China's Glaciers Disappear". NPR.org. Retrieved 21 October 2017. ^ "WEATHER & EXTREME EVENTS 7 of 10 Most Air-Polluted Cities Are in China". JAN 16, 2013. Imaginechina/Corbis. http://news.discovery.com. Retrieved 1 September 2014. ^ "THE WORLD'S WORST POLLUTED PLACESThe Top Ten(of The Dirty Thirty)" (PDF). Archived from the original (PDF) on 11 October 2007. Retrieved 18 February 2012. ^ "Winter in Urumqi, one of the world's most polluted cities Alison Bate". The Star. Toronto. 31 December 2008. Retrieved 18 February 2012. ^ "Urumqi to invest heavily to cut air pollution – People's Daily Online". Retrieved 18 February 2012. ^ a b Li, Juan Li; Guoshun Zhuanga; Kan Huanga; Yanfen Lina; Chang Xua; Shulong Yub (2008). "Characteristics and sources of air-borne particulate in Urumqi, China, the upstream area of Asia dust" (PDF). Atmospheric Environment. 42 (4): 776–787. doi:10.1016/j.atmosenv.2007.09.062. Retrieved 18 February 2012. ^ "CHINA: Ürümqi / 乌鲁木齐市". City Population. ^ a b Piper Rae Gaubatz (31 March 1996). Beyond the Great Wall: Urban Form and Transformation on the Chinese Frontiers. Stanford University Press. pp. 73–75. ISBN 978-0804723992. ^ Toops, Stanley W. (4 March 2015). S. Frederick Starr (ed.). Xinjiang: China's Muslim Borderland. Routledge. p. 244. ISBN 9781317451372. ^ James A. Millward (2007). Eurasian Crossroads: A History of Xinjiang. Columbia University Press. pp. 306–307. ISBN 978-0-231-13924-3. ^ Wiener, Calla (4 March 2015). S. Frederick Starr (ed.). Xinjiang: China's Muslim Borderland. Routledge. pp. 168–169. ISBN 9781317451372. ^ James A. Millward (2007). Eurasian Crossroads: A History of Xinjiang. Columbia University Press. p. 260. ISBN 978-0-231-13924-3. ^ a b 2000年人口普查中国民族人口资料. 民族出版社. 2003. ISBN 978-7-105-05425-1. ^ "WŪLŬMÙQÍ SHÌ (Prefecture-level City)". City Population. ^ Xinjiang Uygur Autonomous Region People's Government Census Leaders' Office (August 2012). 《新疆维吾尔自治区2010年人口普查资料》 (in Chinese). China Statistics Print. ISBN 978-7-5037-6516-2. ^ "hktdc.com – Profiles of China Provinces, Cities and Industrial Parks". Tdctrade.com. Retrieved 19 February 2010. ^ "17th Urumqi Trade Fair opens – CCTV International". CCTV.com. ^ MAISON MODE · 美美. ^ "Urumqi Tartar Mosque - Mosques in China - muslim2china.com". ^ "Urumqi Subway finally opens!". Pakistan Defense. 31 October 2018. Retrieved 16 February 2019. ^ 刘若涵إذا سحارةليو (20 April 2012). 新疆乌鲁木齐市投资312.4亿元建设两条轨道交通. Tianshan Net. Retrieved 24 October 2012. ^ 张亚庆 (14 September 2012). 乌鲁木齐市地铁一号线沿线勘查开始招标. Tianshan Net. Retrieved 24 October 2012. ^ "NW China's Xinjiang launches BRT bus service CCTV News – CNTV English". CNTV. Retrieved 17 February 2012. ^ "Urumqi BRT". chinabrt.org. Archived from the original on 18 March 2012. Retrieved 17 February 2012. ^ "Xinjiang Ice Sports Center (CHUQ) – Rink – SpeedSkatingNews". ^ Yi Yanjun (2 September 2014). "Twin Towns and Sister Cities (Abroad)". Hong Shan. Archived from the original on 21 December 2015. Retrieved 21 December 2015. Owen Lattimore. (1973) "Return to China's Northern Frontier." The Geographical Journal, Vol. 139, No. 2 (Jun. 1973), pp. 233–242. Zang, Xiaowei. "Ethnic variation in network composition in Ürümchi: do state policies matter?." Ethnic and Racial Studies. 2013. Volume 36, Issue 1. DOI: 10.1080/01419870.2011.644313. p. 179–198.